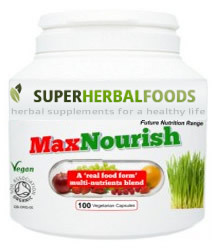 MaxNourish Capsules (formerly called MAXvits SuperFoods. Same product, new name) is a 100% all natural & Food Supplement formulated just as Nature intended. This herbal food combination contains some of Natures most nutrient dense herbs, resulting in a potent Multivitamin, Multimineral, Amino Acids and Trace Elements supplement. Alfalfa Leaf: Alfalfa has therapeutic uses as both food and medicine. A rich source of vitamins & minerals, particularly Vitamins A, B and C and also Vitamin K. It yields 10 times more mineral value than average grains. A natural source of calcium, potassium, magnesium and phosphorus. Contains 8 essential enzymes that promote the correct digestion & utilisation of foods. Actions: Digestive system tonic, Anti-cholesterol, anti-haemorrhagic, anti-anaemia, anti-coagulant. To promote strong bones & teeth, against dyspepsia, constipation, kidney, prostate & prostate problems. Stimulates peristalsis of the bowel, reduces constipation and supports the liver. It is most helpful in treating kidney and urinary tract infection and will help detoxify the body, especially the blood & liver. A great natural diuretic.e liver, gall bladder, spleen and kidneys. Baobab Fruit: The Baobab tree native to the Southern African states.' Revered by the native African population for its nutritional and medicinal properties, the ripe fruit is consumed for its unique combination of vitamins, minerals and essential amino acids. Tipped to be the next 'superfruit' the Baobab is high in antioxidants, low in fat and high in fibre. Naturally dehydrated and so requiring minimal processing, the powder retains its unique combination of vitamins and minerals. Barley Grass: An almost perfect food, barley grass is one of the green grasses - the only vegetation on the earth that can supply sole nutritional support from birth to old age. Barley has served as a staple food in most cultures. Astounding amounts of vitamins and minerals are found in green barley leaves, which have an ability to absorb nutrients from the soil. When barley leaves are 12-14 inches high, they contain many vitamins, minerals and proteins necessary for the human diet, including chlorophyll which is a natural detoxifier. These are easily assimilated throughout the digestive tract, giving our bodies instant access to vital nutrients made by Nature. These include potassium, calcium, magnesium, iron, copper, phosphorus, manganese, zinc, beta carotene, B1, B2, B6, C, folic acid, and pantothenic acid. It is 7 times richer in Vitamin C than oranges, 5 times richer in iron than spinach and contains 25 times the potassium of wheat. Highs in the enzyme superoxide dismutase (SOD), know for it's anti ageing actions. Beetroot: A rich source of organic minerals. As beets are root vegetables that grow underground, they change inorganic hard rock mineral elements into plant minerals that are easily digestible and almost fully assimilated by us. High in Iron and Silicic Acids, Beetroot (and Spinach) is well known for its blood building (regeneration of red blood cells) and energy production properties. Also contains Vitamins A, C, E, flavonoids & fibre. Assists the liver to break down stored fats. Bilberry Fruit: A superfood, know for it's beneficial blue juice from it's blue pigment. This pigment is a wonderful gut healer which also helps protect the lining from mechanical irritation and reduces inflammatory secretions. It is also effective against some forms of diarrhea forming bacteria. The antioxidants that blueberries contain have a wide range of other benefits, such as prevention of urinary tract infections and overall memory improvement. The blue pigment is identified as an anthocyanoside-type flavonoid, known for it's beneficial actions on improved night vision, increased blood flow to the retina and flexibility of cell membranes and capillaries. It is also thought that bilberry extract may even reduce pressure inside the eye. Actions: anti-inflammatory, anti-diarrhoeal, diuretic, astringent, vein tonic, anti-bacterial. Some people use bilberry for conditions of the heart and blood vessels including hardening of the arteries (atherosclerosis), varicose veins, decreased blood flow in the veins, and chest pain. Carrot Root: Simply put : NEW YORK (Reuters Health) - Eating lots of carrots and cruciferous vegetables -- collard greens, cabbage, broccoli - could reduce breast cancer risk, particularly an aggressive form common among African American women, suggests a large new study. Because of its goldmine of nutrients and associated healthful benefits, carrot juice is frequently called a "miracle juice." Carrot is one of the richest sources of vitamin A that can be used in the daily diet. It also ranks high as a source of the other vitamins, especially those of the B complex. Its mineral content is equally rich, and includes calcium, copper, magnesium, potassium, sodium, phosphorus, chlorine, sulphur and iron. Dandelion Root: the leaves and roots have been used for centuries to treat liver, gall bladder, kidney, and joint problems. Considered a blood purifier and used to treat poor digestion, water retention and diseases of the liver such as hepatitis. Actions: Diuretic, hepatic, cholagogue, anti-rheumatic, laxative, tonic, bitter. It is a general stimulant to the system, especially to the urinary organs, and is primarily used in kidney and liver disorders. Increases bile production in the gall bladder and bile flow from the liver. This makes Dandelion a great tonic for people with sluggish liver function due to alcohol abuse or poor diet. The increase in bile flow can help improve fat (including cholesterol) metabolism in the body and it also cleanses the blood. Green Tea Leaf: When black tea is produced, the beneficial polyphenols are oxidised. However, Green Tea's polyphenols and antioxidants are not oxidised and the organic leaves used in this product have not been processed in any way. Catechin is one of the potent ingredients that gives green tea its health-enhancing abilities. It is only found in green tea, because the fermentation process involved in the making of black tea removes the catechin. Catechins are more powerful than vitamin C and vitamin E in halting oxidative damage to cells and appear to have other disease-fighting properties. The polyphenols have strong antioxidant properties which help protect the body against damage caused by free radicals. Uses: Green tea leaves may help to protect against various types of ailments such as guard against cardiovascular conditions by lowering cholesterol levels and reducing blood pressure, promote longevity, stave off tooth decay, help heal gum infections and provide a number of other benefits. It is found to have some anti-carcinogenic actions in animal studies. Also used as a slimming aid and diuretic. Kelp: a seaweed which is high in Iodine and many other minerals and trace elements such as potassium, magnesium, calcium & iron. The Iodine is used by the thyroid gland to produce Thyroid hormones, responsible for normal metabolism in all body cells, energy levels and elimination of waste matter from cells. Uses: detoxification, energy production, weight management, cellulitis, obesity, water balance and overall health. Lemon Peel: Packed with vitamins, minerals flavonoids, oils, antioxidants, hesperdin, rutin and all the trace elements necessary for Vitamin C assimilation. The peels of vegetables and fruits also contain dietary fiber, which is key for moving food through the digestive system required for daily elimination and protection from disease. Citrus fruits like lemons, limes and grapefruits have powerful flavonoids, limonene and rutin in their peels. Flavonoids help give fruits and vegetables their bright colors and have health properties: Anti-allergic, Anti-cancer, Antioxidant, Anti-inflammatory, Anti-viral. Many studies have shown, too, that high flavonoid intake results in lower incidence of heart disease. Limonene is a compound found in the peels of citrus fruits. This oil is fresh smelling, multi-purpose (found in organic household cleaners) and helps keep your body healthy. It encourages the natural detoxification process of your liver. Rutin is a bioflavonoid in citrus peels that can chelate heavy metals like iron. Uses: to maintain strong collagen and tissues, active immune system, absorption of Iron, control of blood cholesterol levels, antioxidant. Supports nourishment, organ cleansing, protection against ailments & free radical damage. Spinach Leaf: As with Beetroot, Spinach leaf contains high amounts of organic and easily assimilated minerals and at least 3 different flavonoid compounds that function as antioxidants. An excellent source of other bone-building nutrients including Vitamin K, calcium and magnesium. Folate levels help the body convert a potentially dangerous chemical called homocysteine that can lead to heart attack or stroke if levels get too high, into benign molecules. Spirulina: purifying diets fasts body cleansing regimes. A very nutritious food supplement prepared from plant plankton, a blue-green micro algae. Among food supplements, spirulina stands out as an excellent dietary source of chlorophyll. As spirulina is an aquatic plant that does not contain thick, indigestible cellulose cell walls, its chlorophyll is more readily bioavailable than other nonaquatic plant sources. It contains no less than 18 amino acids including 8 essential amino acids, which cannot be produced in the body and therefore need to be replenished daily by food. Rich in beta-carotene, Vitamin E, iron and protein levels i.e. 100 grams yields 50% - 70% protein. High levels of Vitamin B12 makes it a favourite amongst vegetarians & vegans. Uses: The high levels of chlorophyll and nutrients make it a potent blood purifier. The high chlorophyll content makes it a great nourishing and Body Detox ingredient and most beneficial during purifying diets, fasts & body cleansing regimes. Turmeric Root: detoxifier. A strong & proven antioxidant which also helps to inhibit the degradation of essential fatty acids. Contains volatile oils, vitamins & minerals. Actions: blood purifier, anti-inflammatory (arthritis, skin disorders, asthma), anti-oxidant, carminative, bile stimulant, detoxifier and re-generator of Liver tissue, helps to lower cholesterol. The yellow colouring, Curcumin is toxic to Salmonella bacteria and a very strong free-radical scavenger. Wheatgrass: body detoxifying. One of Nature's most complete Vitamin, Mineral & Trace Minerals source herb. Rich in chlorophyll and enzymes, wheatgrass is the crop from germinated seeds of wheat grains. Grain grasses are more potent than the grains themselves. It is also a natural source of Superoxide Dismutase (SOD) - an important enzyme in body detoxifying processes. Contains NO: Lactose, Added Sugar, Artificial Colours or Excipients.